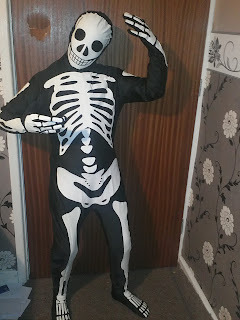 Well, this year, David was a glow-in-the-dark skeleton thanks to the win I had with Morphsuits on Facebook. 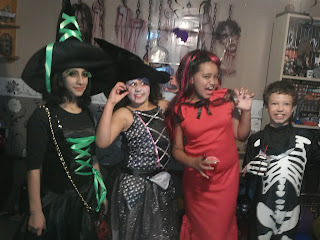 He's 10 now, so he wanted to go trick or treating for the last time this year, but he also wanted an Hallowe'en party with his party goodies he won for his writing competition at 'Ghoul School' from Woolworths last year. 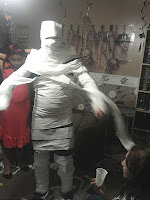 So we decided he could go trick or treating on Hallowe'en, but that we would have an Hallowe'en party for him on the 2nd November, the Friday after Hallowe'en, that way the kids wouldn't have to be in bed too early like they would on a school night. 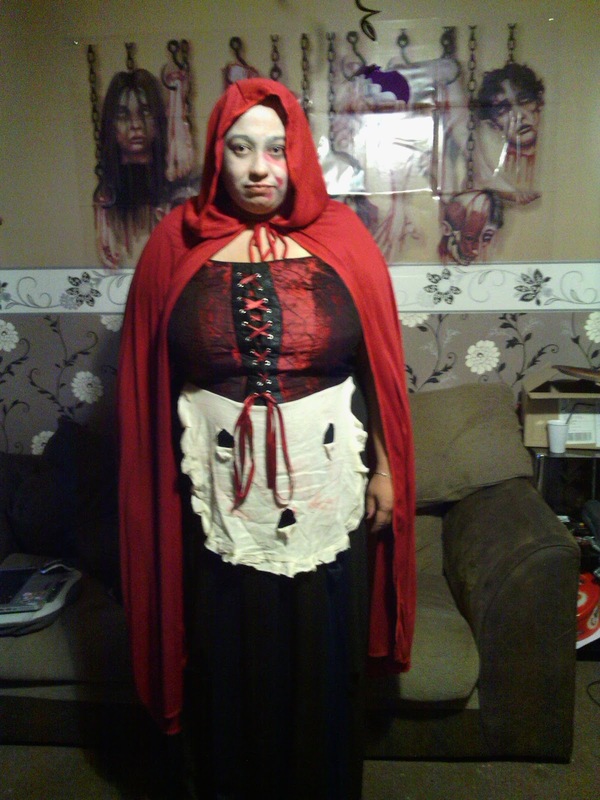 Anyway, David went trick or treating with his 10 year old Auntie (my sister) Latisha, who dressed as a vampiress. It was a dismal night actually as it was raining a lot and was very cold. I didn't go as my teeth had been hurting a lot and I didn't want the cold to aggravate them, so Paul went with my Mum (Liz) and my other sister, Yasmin around with the kids. They got a fair few sweets and goodies. The kids being as mad as they are, decided to trick or treat in an Indian takeaway. 15 minutes later, they apparently came out with a bag of poppadoms!! That's got to be the oddest treat I've ever heard of!! When Paul and David got home, they were extremely soggy. 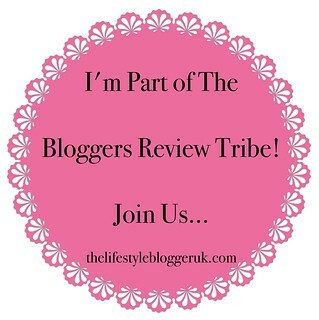 I think I could have make a bucket full of water out of their clothes and shoes! Main thing is, David had fun and enjoyed his final trick or treat Hallowe'en and got lots of goodies to pig out on! So, next up was Friday and the late Hallowe'en party. It was for David and Latisha and we said they could each invite 5 friends. 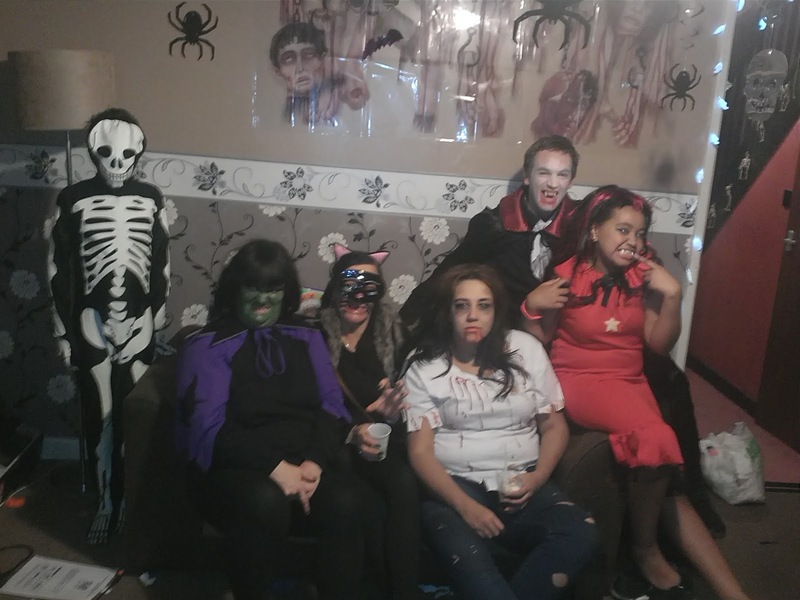 None of David's friends turned up and only 2 of Latisha's :( They all had fun together though. We had some fun stuff lined up for them and I definitely think they enjoyed it. We had the party from 5pm until 8pm and we actually ran out of time to do everything planned! 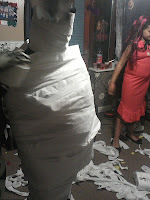 We had them work in pairs to wrap each other up in cheap toilet rolls as a 'Mummy' and then the team that did the best won sweets. Next up, we had some 'ten-pin bowling' Hallowe'en style... We used 10 butternut squash as the pins and a small pumpkin as the bowling ball. They all had fun doing this and it was very funny to watch as well! Then it was time for some food. I'd made some spooky, scary Hallowe'en themed cupcakes as well as chicken sandwiches, cheese sandwiches, sausage rolls, cheese & onion rolls, cocktail sausages, scary jellies (three layer, different colours containing jelly eyeballs and jelly body parts) and crisps. Next up was piñata. This took them a long time to actually get into it! They showed a bit more enthusiasm in the bashing at it when we told them to imagine it was the teacher who was most mean to them at school :P There eyes lit up once they finally got it open and loads of sweets poured out. After we scared them earlier, they thought it was going to be filled with something yukky! That was all we had time for as it was then 8pm and the parents were coming along to pick up the kids. We had also planned to do what I'd call 'duck apple' but hubby would call 'apple bobbing' but we just didn't have the time. They all seemed to have fun with is most important. We gave they goody bags filled with little toys and goodies to pile their sweets in too and take home. After that was the adults party, which in the end, we decided to make just a small thing - family and close friends. We were originally going to go for a bigger party, but decided not to in the end. It was just me, Paul, David, Liz (my Mum), Yasmin (my sister), Latisha, Carol, and Ricky. 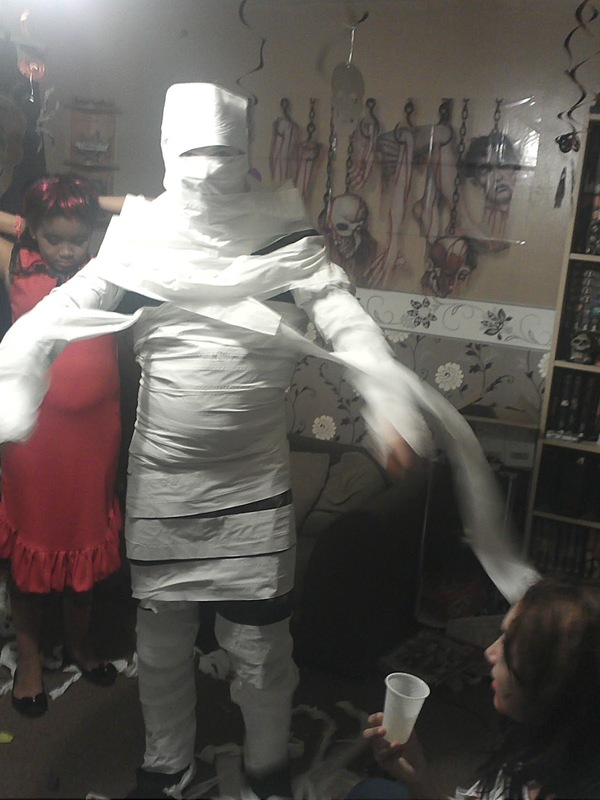 The living room was a tip the next day - toilet roll everywhere! But it was all in the name of fun, so, oh well! 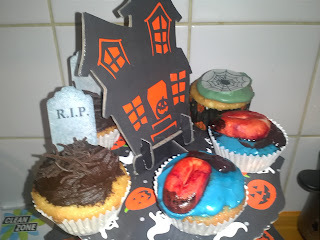 Fantastic costumes and the cakes look delicious! Looks like you had a brilliant time!! Wow, such effort! 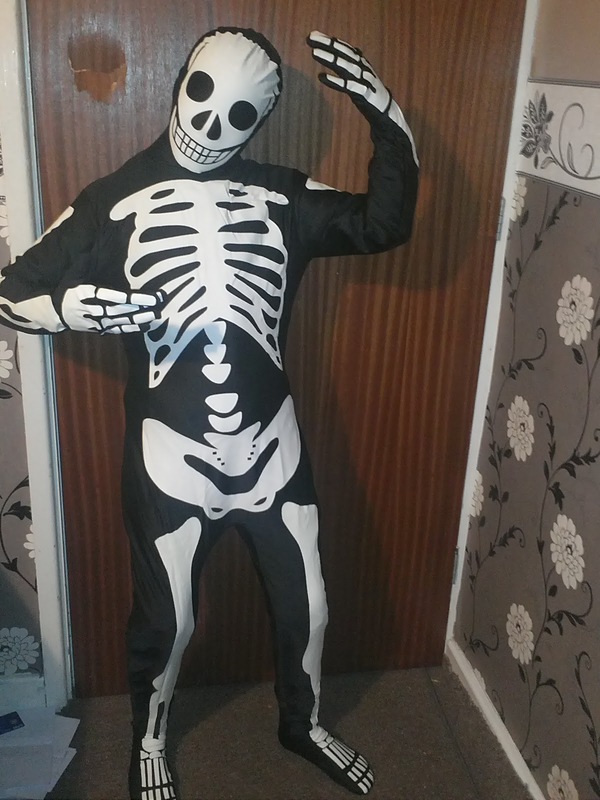 we never done anything for halloween... my kids were not interested and my 2 year old was petrified of the guisers that came round! Sounds like so much fun! I miss being a kid and dressing up for Halloween :( Those were the days!